When I called for-profit Quest College this week and asked to speak with Larry Earle, the receptionist insisted there was no one to reach there by that name. But that wasn’t true. 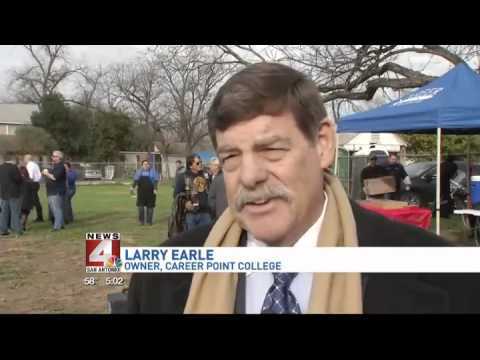 Lawrence Earle, the for-profit college owner whose San Antonio-based Career Point College closed in October 2016 after findings of serious misconduct, has been quietly helping to run Quest, another San Antonio school, according to current and former Quest employees. On Wednesday, Quest’s long-time owner acknowledged to me that Earle is involved with her school; she described him as a consultant. Texas officials say that, depending on Earle’s relationship with Quest, his role could raise questions under state law. Calling people who are supposed to be college admissions staff “salesmen” raised additional concern about what kind of operation Earle was running, and complaints filed by former Career Point employees cast further doubt on Earle’s assurances about his school. Taken together, the allegations regarding Career Point raise questions about whether Earle should be helping to run any college. Meanwhile, Earle’s decision to shutter his college left Career Point’s employees without paychecks, left the college’s 1400 students struggling to find new schools, and left Texas authorities scrambling to assist them. Government data shows that about 87 percent of Career Point’s revenue came from taxpayer-funded federal student grants and loans from the Department of Education — perilously close to the 90 percent maximum allowed under federal law. The plight of Career Point students underscores the need for strong rules to protect students and taxpayers against predatory and reckless practices by for-profit schools. Unfortunately, Trump Secretary of Education Betsy DeVos is abandoning such protections. Yet it appears that Larry Earle already is back in the lucrative for-profit college game. On October 13, 2016, the Department of Education wrote to Earle, recounting that Career Point had informed the Department that it illegally held on to $4.6 million that should have been returned to students or to the Department, and informing Earle that the Department was putting the school on “heightened cash monitoring” status and requiring Career Point to post a $10 million letter of credit. In fact, the Department of Education did not “terminate” Career Point College. In light of the company’s admission that it had kept nearly five million dollars that belonged to students and taxpayers, the Department took the prudent and appropriate step of requiring the company to post a letter of credit equal to 25 percent of the school’s annual take of federal student aid of $40 million — so money might be available to pay the school’s obligations in the event of further financial mismanagement or abuse. But with Career Point shut down and in bankruptcy, Larry Earle seemed to jump back quickly into the career college business. Current and former Quest College employees have been telling me that Earle has been a regular presence in the Quest offices for almost a year. They heard the school’s long-time owner, Jeanne Martin, say that she was thinking about selling the school, which focuses on health care training programs, to Earle. Quest employees have referred to Earle as the new owner of the school, or have said that a relative of Earle is now the owner, but I haven’t seen evidence of any such change in ownership. Another employee heard a manager refer to Earle as a consultant to Martin. On Tuesday, I called the main number for Quest College, and asked for Larry Earle. The receptionist who answered the phone responded that Earle “is not employed at Quest College” and repeated that sentence when I asked additional questions. When I pressed, she acknowledged knowing Earle, but when I asked how she knew him, she said because “he’s in our industry.” I asked if Earle had an office at Quest, and she said no. When I asked if Earle was an investor in Quest, she said she wouldn’t know the answer. Soon after I called, according to a Quest employee, senior managers at Quest held a meeting. After that, staff were instructed to say, if anyone asked, the same sentence the receptionist told me: Larry Earle is not employed at Quest College. This Quest employee told me that Earle, in fact, has been coming into the office every day, although he was conspicuously absent on a day two weeks ago when an official of the Texas Workforce Commission, which oversees career colleges in the state, came for an inspection. The employee said that Earle works out of a conference room in Quest’s corporate office, which is in the same building as the school campus. Larry Earle did not respond to my efforts to reach him to discuss his role at Quest and allegations regarding Career Point. While Earle’s role at Quest, which gets about 81 percent of its revenue from federal taxpayers, remains somewhat unclear, it is apparent that he is helping to bring in a new team: Employees told me, and Martin confirmed, that five or six of Earle’s former employees at Career Point are now working at Quest. Meanwhile, several long-time Quest employees have been fired since Earle’s arrival. And on the website Glassdoor, there are currently advertisements for 20 jobs at “Career Point College,” even though that school is no longer operating. Former Quest and Career Point employees told me they believe these listings are actually for jobs at Quest, but Martin denied that, writing to me, “We run our own advertisements when we need to hire people.” I don’t have any basis to question Martin’s statement. At the same, I sure wonder why someone keeps posting fresh ads for a college, owned by Larry Earle, that shut down last year. Quest is “being shameless about” the fact that Earle is now helping to operate the school, says a former Quest employee. This former Quest employee, as well as two current Quest employees, and one former Career Point employee who spoke with me, asked that their names not be used, out of concerns about their careers. One former Quest employee, Sharon Allen, who directed education programs at the school from February to September 2016, was willing to talk on the record. Allen says that around the time she was leaving, and just a few weeks before Career Point shut down, Larry Earle made several visits to Quest and met with Jeanne Martin. Allen says that Martin was talking openly about retiring and selling the school. Allen reports that current employees have told her that by the end of 2016, Earle was showing up in the Quest offices full time. Martin, meanwhile, told an employee that it was nobody’s business who now owned Quest. Under Texas law, an owner or administrator of a school that was deemed by the Texas Workforce Commission (TWC) to have “closed with violations” of law is prohibited from owning, or serving as a representative, director, or instructor, or having a “management agreement,” at another career college operating in Texas, because the TWC deems such former owners to lack the required “good character” to take on such roles at another school. Earle has filed no such request for approval. The TWC also told me, “Quest College has not requested nor received a change of ownership nor has there been any known change in their approved structure.” Under the law, a potential new owner must apply to the TWC before completing the purchase of a college. Much of the debt that Career Point reported in its bankruptcy is owed to media companies like Cox ($591,625), which owns seven radio stations in the San Antonio area, and KABB-TV ($210,307). That likely reflects extensive spending by the college on advertising to recruit new students. Career Point had a troubling record, well beyond the matter of the improperly-retained $4.6 million that arose last year. The lawsuits filed by former Career Point students allege a range of disturbing practices, including failing to apply federal aid to student accounts, pushing students into expensive private loans, and even charging students for meetings with the school’s financial aid office. The suits also alleges that Career Point staff shredded company documents, and last October a Texas state judge granted a temporary restraining order directing Career Point not to destroy documents linked to the students who sued. The Hernandez complaint also alleged that the school concealed the felony convictions of new students to ensure their eligibility for financial aid. When one graduate complained to the school that she then couldn’t get the job she sought because her felony conviction was deemed disqualifying, and then learned that a school official had apparently forged her signature on documents, she filed a police report. According to Hernandez’s TWC complaint, the school then covered that student’s loans in exchange for her dropping the charge. Melanie Martin backed up allegations also made by Hernandez: that the school told students to omit criminal convictions on their applications; that it “notarized statements of students having high school diplomas without asking for proof, to get them to enroll”; that it forged parent names on federal Parent Plus loans when parents didn’t sign. Martin further alleged that at staff meetings, staff “were threatened constantly with the loss of our jobs if we did not make our numbers” of enrolled students; “we were instructed to not let any student leave without enrolling.” And she alleged that the school would change students’ financial aid status from “dependent” to “independent” in order “to get students through Financial Aid when they did not want to call their parents knowing the parents would say ‘no’.” School staff, Martin alleged, also would use phony tax identification numbers for students who did not immediately provide one. May discussed a student “who was mentally challenged” and wanted to re-enroll at Career Point to study information security. The student disclosed that he had a California felony conviction, but his admissions representative advised him to exclude it on his enrollment form. But a felony conviction, plus a mental disability, would make it difficult to say the least for the student to obtain his chosen job; as May wrote, “It seemed as if no one cared that [the student] had just spent about $17,000 on a PC Tech program he could not get placed in.” May also confirmed Hernandez’s account that Career Point staff had forged an admission documents for another student, affirming, falsely, that she didn’t have a felony conviction. In his TV interview last year, Larry Earle said about Career Point, “The college, except for a few employees, did nothing wrong.” He appeared to be referencing only the “few employees” he blamed for not refunding the $4.6 million owed back to students and the Department of Education.